The Tokyo-based Research Institute of Economy, Trade and Industry (RIETI) and IZA World of Labor joined forces to discuss international evidence and the policy implications for Japan’s demographic challenges in the Policy Symposium “Reforming Labor Market Institutions to Promote Elderly Employment”, held in Tokyo on May 26, 2015. In his opening remarks RIETI President Masahisa Fujita stressed the value of evidence-based policy, a common thread in the activities of RIETI and IZA. IZA’s Director for Strategy and Research Management Alessio J.G. Brown highlighted the need for evidence-based scientific policy advice and presented IZA World of Labor as an example how to support evidence-based policymaking in labor economics. 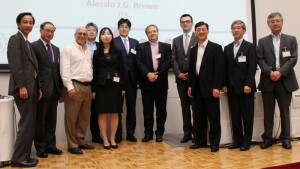 Various leading international and Japanese researchers presented experiences and evidence. In the first keynote David Neumark (UC Irvine) showed that age discrimination laws in the US have complemented social security reforms to boost the labor supply of older workers. Nonetheless, while successful in normal times, these laws failed during the Great Recession since they reduced hiring of older workers in the severe downturn. The evidence suggests that age discrimination in hiring in the US persists and needs to be addressed. The European experience of highly regulated European labor markets and the Great Recession was presented by Juan F. Jimeno (Bank of Spain), whose keynote discussed various policy responses based on the European experience to promote elderly employment. He proposed that the degree of employment protection should not depend on seniority. Rather than severance payments, unemployment benefits with some US-type experience rating should be used to compensate for job losses. Jimeno also rejected the “lump of labor fallacy”, which implies that restricting the supply of older workers increases the employment of younger workers, as not supported by empirical evidence. Ayako Kondo (Yokohama National University) provided facts about elderly employment in Japan and evidence on the effects of legislative reforms. Japan obliged employers to offer workers continued employment until the eligibility age for full pension benefits. This implies the need to adjust wages of older workers, and Kondo highlighted that they have actually started decreasing. She also stressed the importance of promoting female labor supply in the light of the shrinking population and relatively low female labor force participation. Promoting female employment is as important as promoting elderly employment, said Kondo. At the beginning of the panel on lessons to be learned for Japan’s policies based on international evidence, Kotaro Tsuru (Keio University, RIETI Program Director) reiterated the need for wages to adjust and called for a shift from the existing employment type of regular employees with an unlimited scope of duties to clearly defined and specified job duties, thus, job-based regular employment. The European experience has shown that those countries which addressed challenges on various policy margins fared much better. A significant margin to address the challenges created by population aging is increasing female labor market participation. In addition to legislative reforms, Tsuru suggested reducing labor market segmentation. Further options discussed were unemployment benefits with experience-rating for older workers and the abolition of a mandatory retirement age. The panelists broadly agreed that the current Japanese social and employment model is no longer viable in light of population aging, and that various complementary instruments should be implemented to induce a change of the Japanese model and its perception.